IN A WINE SHOP filled with hundreds, perhaps even thousands, of potentially desirable options, how does one decide which bottle to buy? Some customers might turn to a staff member for advice, while others might consult the shelf tag. Referred to as �shelf talkers� in retail parlance, these notes describe an individual wine�s qualities in prose long or short. Written by staffers or store marketing teams, or lifted directly from wine magazines (complete with numerical scores), they can serve as an educational guide for shoppers�and a highly effective means of enhancing stores� sales. Take, for example, one shelf talker created by Bob David, a sales associate at chain store Total Wine & More�s West Orange, N.J., location. 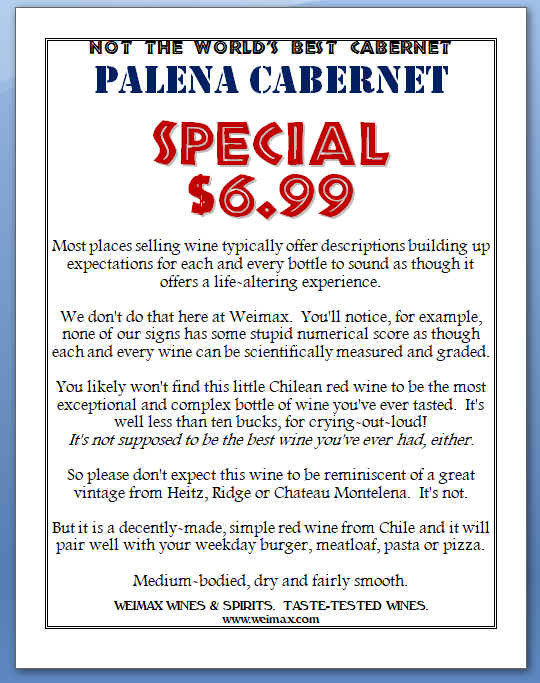 Mr. David said that when he put a note next to a $10 Chilean Cabernet (2014 Vistamar Sepia Reserva) describing it as �The best $10 Cab I�ve ever had! 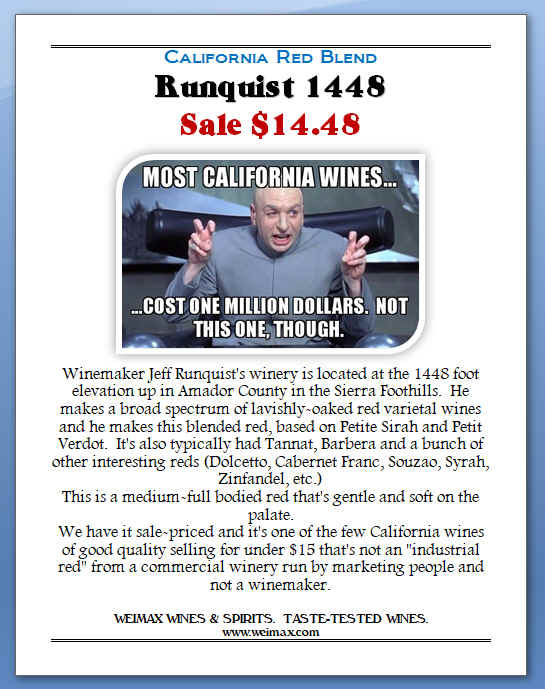 Super!� sales of the wine immediately rose. The store �went from selling one case a month to three cases a week,� said Mr. David, who I was able to easily track down thanks to his note, which featured his photo as well. Mr. David�s words were certainly more compelling than the tame tasting note turned out by the chain�s wine-buying team. Positioned next to Mr. David�s lines (it�s not uncommon for bottles to feature more than one shelf talker), it described the same wine thus: �Maipo Valley Chile�Aromas of ripe black fruits blended with mocha and spices are combined with vibrant flavors of blackberry and currants. This wine presents a smooth body and a sweet and persistent finish. Nice with red meats, pastas and hard cheeses.� Pretty predictable phraseology for a shelf talker. In fact, it could describe a wide range of wines. Perhaps that�s why Mr. David�s forceful characterization resulted in such a jump in sales. Mr. David isn�t the only salesperson doling out advice. Other floor staff had tasting notes (accompanied, like his, by their photos) throughout the store. But these were greatly outnumbered by notes produced by the corporate buying team. Melissa Devore, vice president of wine buying for the Bethesda, Md.-based company, explained that sales associates like Mr. David are permitted to have no more than 10 shelf talkers on the floor at any one time. But, she added, the company doesn�t place any other restrictions on floor staff; they can highlight any wine and write whatever they want. 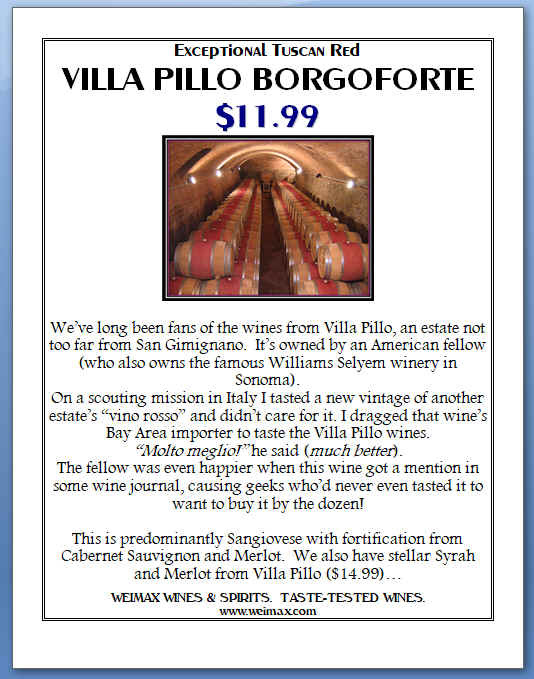 Ms. Devore estimated that sales of a wine rise 20% when it�s accompanied by a tasting note from a critic with a numerical rating. But not everyone thinks shelf talkers are necessary. Leonard Phillips, president of Ambassador Wines & Spirits in New York, disdains their use altogether. �We have a well-trained staff. There�s no reason for shelf-talkers,� said Mr. Phillips. He thinks they are more appropriate for �big-box� stores�naming the sprawling Astor Wines & Spirits in New York�s NoHo neighborhood as an example�perhaps because sales people in such stores must cover so much more square footage. Consumers seem to be equally split. I polled several friends whose vinous knowledge ranged from limited to large, and their responses were predictably mixed. Alan, who knows a lot about wine, admitted that shelf talkers draw his eye. But he called staff picks only �one degree better than Yelp reviews,� especially if he doesn�t know the person. Willie, who knows just a little bit about wine, is also a fan. She likes that the notes allow her to find out about a wine without having to speak to a salesman and thereby reveal her ignorance, she said. 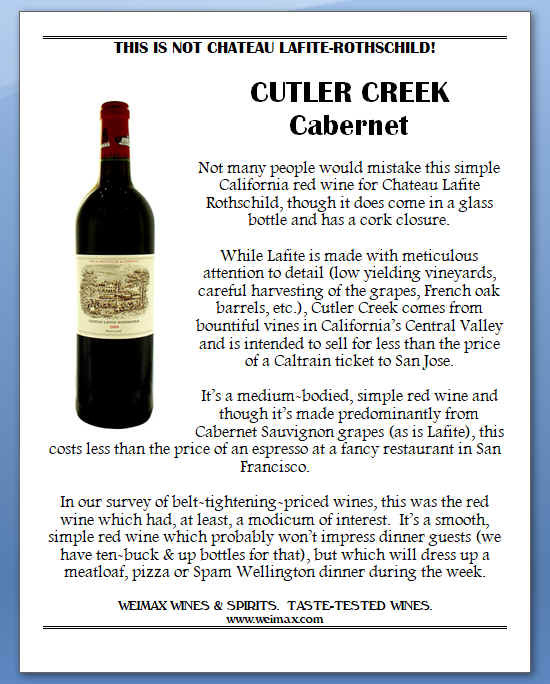 ( Gerald Weisl, owner of Weimax Wines & Spirits in Burlingame, Calif., calls shelf talkers �silent sales people.�) Kate, another wine-neophyte, said she would try a bottle with a tasting note written by a staffer but not one a manager authored. �I just think he would be trying to sell me something� to improve the bottom line, she said, while staffers would be more likely to champion wines in which they believe. Instead, his stores feature several types of staff-written notes, from those highlighting best buys and great finds to ones touting individual staffers� favorite bottles. And he feels that customers aren�t the only ones to benefit from the lines: �They help the staff,� he said. Mr. Fisch has German-, Italian- and French-wine specialists on staff but allows that no one can know everything about every wine. That�s where a good shelf talker is useful. �In fact, I don�t think we have enough,� he said. I found a few stores (all rather large) that were particularly shelf-talker-heavy, including Astor Wines & Spirits and Trader Joe�s Wine Shop in New York, and Bottle King in Wayne, N.J. At the last two, seemingly every square inch of space was covered by a tasting note; at Bottle King, they weren�t only on shelves but glued to boxes on the floor. I browsed the shelves at Astor and Bottle King without an offer of help by a sales associate, but at Trader Joe�s, a voluble woman named Cherry saw me reading the notes and asked if I needed advice. I told her I was open to suggestions. She offered a few favorites straight off, including the 2013 La Crema Chardonnay��one wine I would bathe in, or drink while I�m bathing in it,� she said�and the 2015 Oyster Bay Sauvignon Blanc from New Zealand, because �it�s on sale.� But her favorite was a �gorgeous� 2015 Whitehaven Sauvignon Blanc ($17), also from New Zealand. I took a bottle home. The Whitehaven was the only wine I bought based on a face-to-face exchange and not a shelf talker�although in the case of Mr. David and the $10 Cabernet, I guess it was both. The wines whose tasting notes sounded promising turned out to be simply OK, including the $10 Cab, which was soft and rather sweet�a decent wine for burgers. But the Whitehaven, whose shelf talker (�crisp and clean with notes of citrus�) made it sound appealing if not exactly thrilling, turned out to be a big hit. My friends loved it. One even wanted to buy a case. I never would have purchased the wine based on its note, but Cherry convinced me to take a chance. A shelf talker may be a �silent� salesperson, but the live version is still the very best kind of all. I was on the road when Lettie Teague asked about shelf-talkers and was unable to provide more color commentary and some examples of our handiwork. In our shop, we do not use "canned" Point-of-Sale materials provided by wine producers, importers or sales reps.
Our colleague John K was amused at how people read this sign and immediately grabbed a bottle of "Not the World's Best Cabernet." 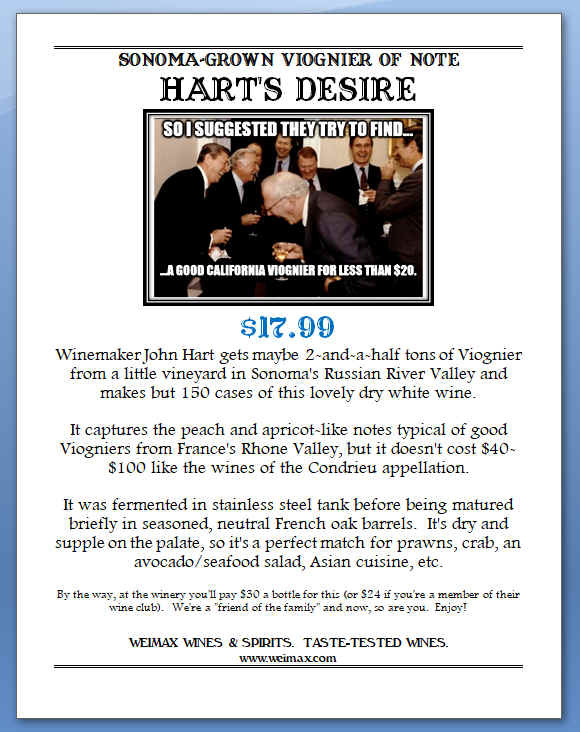 This sign is posted in our front window promoting a simple California Cabernet from the hot Central Valley. It retails for $3.49 a bottle.